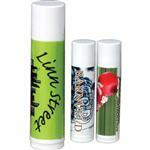 This custom trade show promotional lip balm is actually caffeinated. The perfect gift for people who love caffeine! Cafe impulse purchases, a great This is a super silky sweet moist lip balm, and it is fully customizable with your slogan, logo, and photo! Contains all natural ingredients. This is a unique promotional item that will have people talking. Makes a great wedding or party favor. People will remember these!